A few weeks ago Running Past looked at Lee Green Farm and its farmer – William Morris (no obvious relation to the eponymous textile designer, poet and socialist activist) – Morris was also the tenant of the neighbouring and slightly bigger Horn Park Farm from 1838. Horn Park Farm, like Lee Green Farm, was owned by the Crown and in 1838 it consisted of around 221 acres of a mixture of arable and pasture. It seems to have stretched from around Winn Avenue to Eltham Road and possibly further northwards to the Quaggy. At the Winn Avenue end it bordered College Farm, and from around 1914 Melrose Farm (sometimes known as Woodman’s Farm). An area nearly twice the size, 345 acres, known then as West Horne, had been enclosed in the 15th century and was one of three parks that belonged to Eltham Palace. The Royal family stopped using the Palace early in the reign of Charles I and the Palace was badly damaged during the Civil War and the Commonwealth – John Evelyn noting in 1658 that “both the palace and chapel (were) in miserable ruins, the noble wood and park destroyed by Rich the rebel (Nathaniel Rich)”. 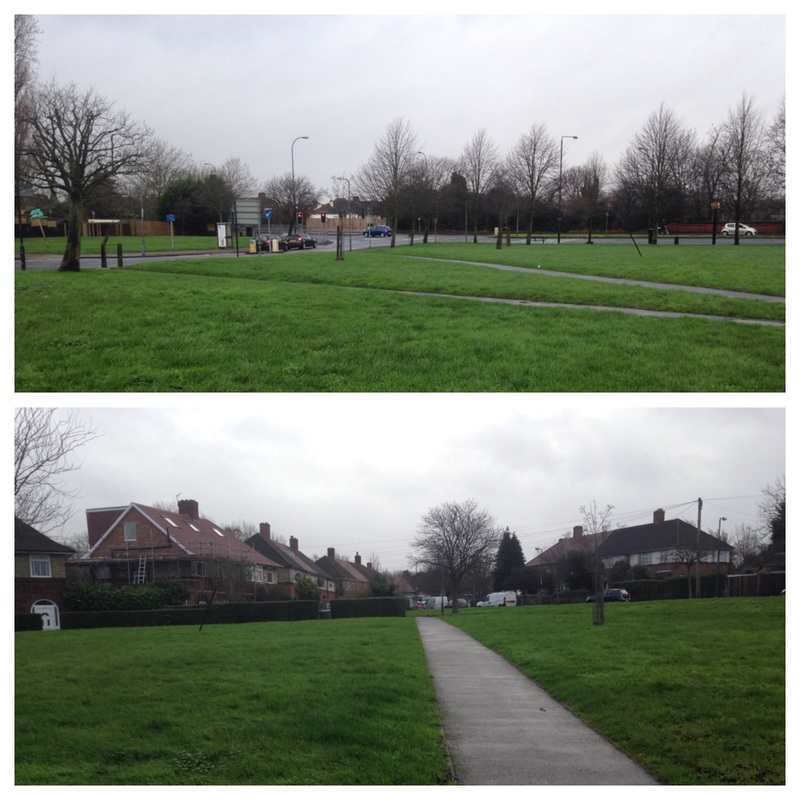 After the Restoration of the monarchy, Horn Park was converted into to a mixture of arable land and pasture with the Crown Estate retaining ownership. The first subsequent on-line mention was in relation to a dispute in 1816 between the Lee and Eltham parishes in relation to the boundary between the two, it oddly went through the bed of the ill farm worker who was claiming poor relief. He got out of bed on the Eltham side so they ended up paying. The farmer at that stage was a Richard Stames. While Morris’ seems to have lived at Lee Green Farm, there were farm buildings at Horn Park marked on the earliest Ordnance Survey Maps up until the 1930s when the area was developed as Horn Park estate, a development not completed until the 1950s due to the intervention of WW2. 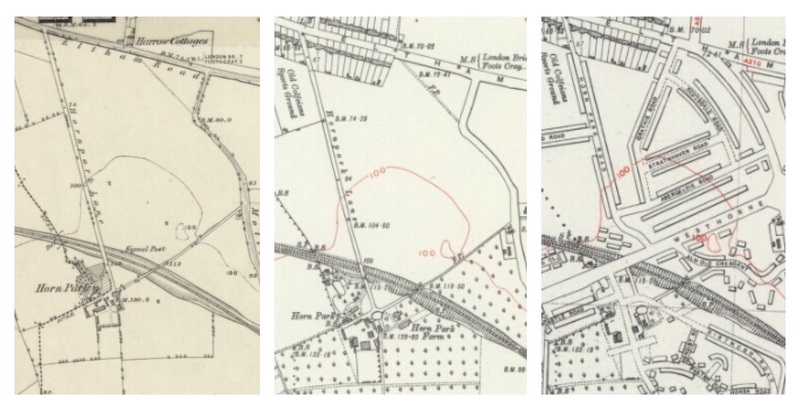 Maps source – Ordnance Survey 6″ via National Library of Scotland – surveys from 1862, 1930 and 1938. The farm buildings were roughly where the grassed area on Alnwick Road, opposite Horncastle Road – close to where Westhorne Avenue now is. It seems likely that when Morris’ lease ended around 1860, that the silk merchant Thomas Blenkiron, son of the racehorse trainer William leased Horn Park and used the farm for grazing racehorses. It is possible that William, while more generally associated with Middle Park, also had some interest in Horn Park as it was one of the addresses listed in bankruptcy proceedings in 1884. The next significant tenants were the Wood family who seem to have moved to Horn Park in the 1880s, presumably after the bankruptcy proceedings of Blenkiron. The first tenant would have been Walter William Wood – his son Walter Thomas Wood was born there in 1888. It was the Wood family’s second farm, Walter (William) seems to have started farming at Crockenhill in Kent – a farm they retained an interest in up until the 1930s. The farming changed under the Woods – while it was predominantly grazing under both Morris and Blenkiron – cows and horses respectively, by 1912 the farm was described as having ‘well cultivated fields.’ There were also orchards at the southern end of the farm – clear on the later OS Maps above. They also grew flowers for the market to – there was a court case involving theft of lilacs the same year in the short-lived Blackheath Gazette . They later diversified into growing bulbs, they were subject to legal action at Greenwich County Court in 1920 relating to a dispute with a Dutch firm of bulb sellers, which they lost. Walter senior died at the farm in 1924 and Walter Thomas died in 1929 in Bromley, it is not clear whether he was still on the farm at that point – he was certainly there in the 1901 and 1911 censuses though. The younger son Sidney, born in 1892, stayed on after the deaths of his father and brother. He married Audrey in 1920. Sidney was made bankrupt in 1935 – possibly as a result of the shrinking size of the farm, the land around the farm house had been lost to the Horn Park Estate and there was housing built along Eltham Road. The farm house had had to move to 34 Eltham Road – on the corner of Cambridge Drive (see photograph at the end). The reduced size of the area for cultivation probably wasn’t enough to help keep the business afloat. With the demand for land from a growing London, how long it would have been able to keep going beyond 1935 was probably questionable anyway. The couple stayed in Lewisham after the break-up of the farm around the outbreak of WW2. Audrey died in 1968 and Sidney ten years later. The Farm was home to a number of sporting events – this included many of the fields that the horses and riders of the Lee Races would have galloped through in the 1830s. In 1914 it was home to the annual Lewisham Horse Show. 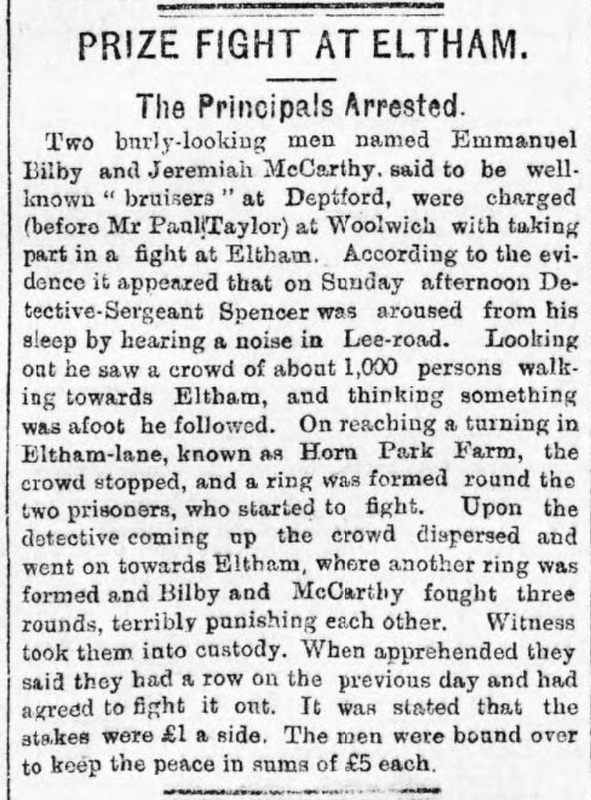 There was at least one illegal prize fight between Emmanuel Bilby and Jeremiah McCarthy, both of Deptford which was spotted by a local constable who followed crowds there in early 1899. It isn’t clear whether the fight was with the Wood’s sanction or not. 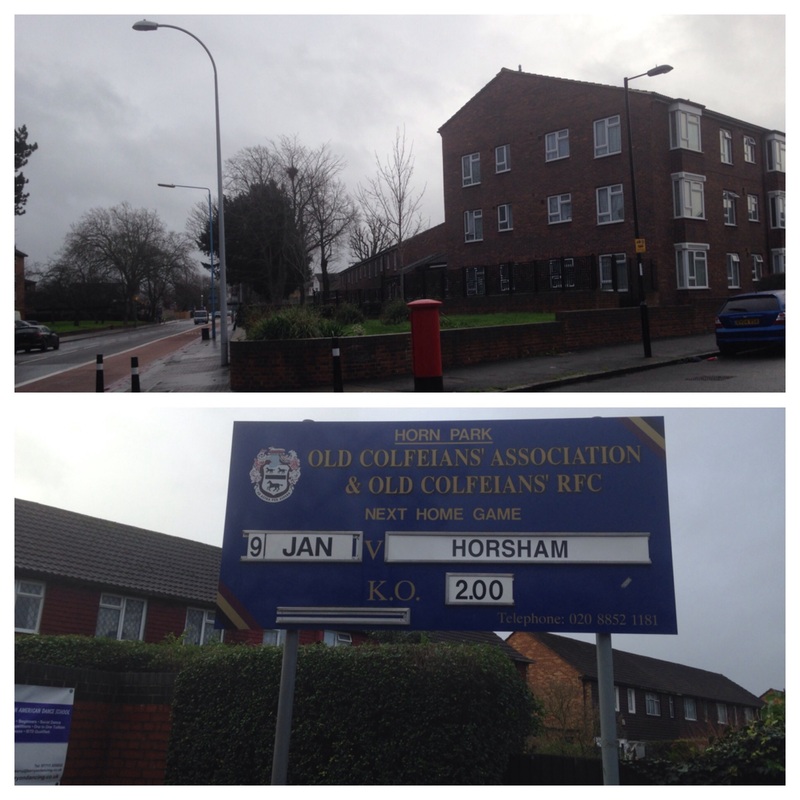 Finally, one of the early ‘losses’ of land was what is now the Old Colfeans sports ground – the Old Alleynians played rugby there for at least a season around the turn of the 19th and 20th centuries, and it seems to have been used for sport ever since. It was sold the Leathersellers Company as Trustees for Colfes School, then a Grammar School sometime after 1929. The current site of the school was also part of the farm. This entry was posted in Lewisham History and tagged Horn Park Farm, Lee Races, Walter Wood, William Morris - farmer on January 27, 2016 by Paul B. My grand father was Sidney basil wood of horn park farm and two of my sons went to colfes school which would of been on their great grandfathers property.